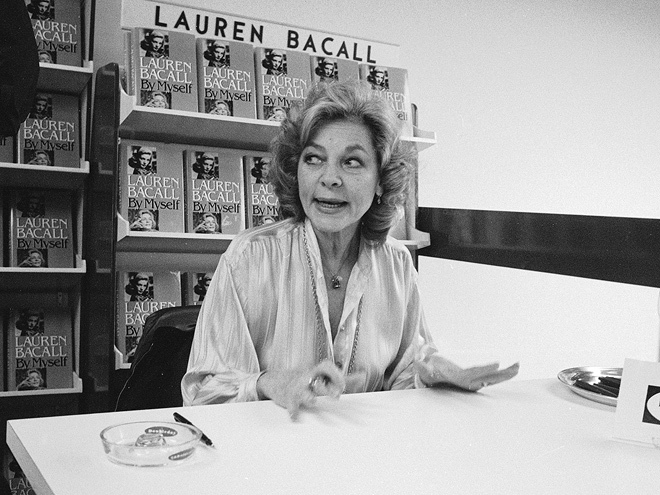 I think I was in high school when I became enamored of Lauren Bacall. I have no idea why. It might have been that she was starring on Broadway then, and I was into all things theater; it might have been. . . geez, really, that’s all I got. I mean, I hadn’t seen any of her movies at that point—didn’t for years—and was hardly a film aficionado. The only other thing I can think of is that I read the book Real Women Bring Flowers, and there were a number of choice Bacall (or, perhaps, screenwriter) quotes sprinkled throughout the text. In any case, I read her first autobiography, By Myself, and promptly decided she was a dame worth admiring. I knew she was called Betty by friends, that she held her chin low in that first scene with Bogart to keep it from quivering, almost married Sinatra, and didn’t see the physical resemblance so often pointed out to her between her first (Bogart) and second (Jason Robards) husbands. What was admirable about any of that, or anything else that she wrote or said or did? I honestly can’t say. Maybe because she did seem honest, forthright, that she was beautiful and strong and smart and never hid any of it. She was who she was. To a teenager who wasn’t at all sure of herself or her place anywhere, that you could simply be seemed astonishing. And worth admiring, then and now.